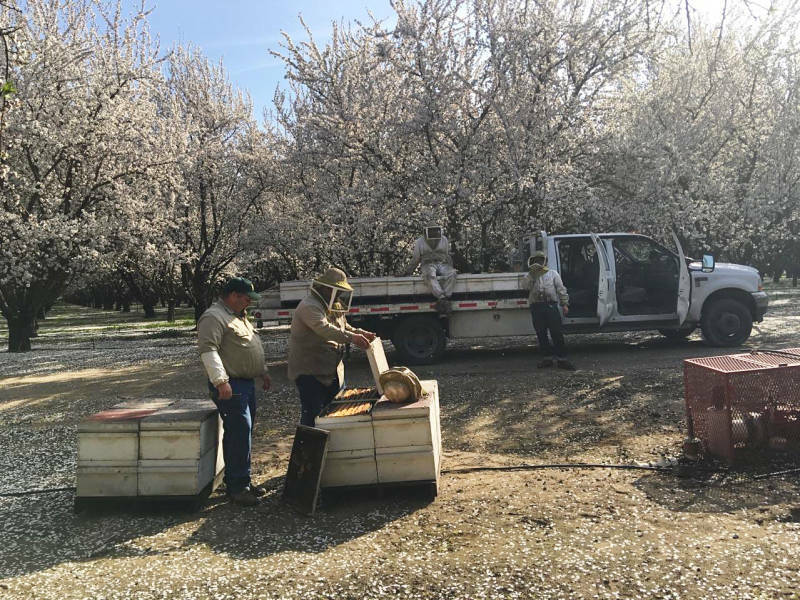 Beekeepers flock from all over the country to California every February and March to watch billions of honeybees buzz around the state's almond trees. Eighty percent of the country's commercial bees visit the Golden State each spring. So I went to check out the scene at an almond orchard at Fresno State. "Really, the key is to stay calm around bees, because if you're afraid, then your body physiologically changes and they can sense that," beekeeper Brian Hiatt tells me. "They literally can smell fear." He should know: In this orchard alone, Hiatt has about 1.5 million bees. Spring is usually a really busy time for beekeepers. But this year, Hiatt says he's worried that a relatively new variety of almonds called Independence could harm the longevity of his business. Independence almond trees are easy to harvest, and they make tasty almonds. But what really sets them apart is the fact that they're self-fertile — meaning they technically don't need bees to pollinate their flowers because they're pollinating themselves (though some farmers say if you use just a few bees, you'll get an even bigger crop.) That's a boon for farmers, who spend lots of money hiring bees to pollinate their crop. "There are a lot of these old almonds that still need bees," Hiatt notes. But as Independence almonds become more popular, he thinks he'd lose profits. Others in the industry — including Gene Brandi with the American Beekeeping Federation — see things differently, especially since a colony collapse disorder has killed as much as 40 percent of the honeybees in the West. "I know how difficult it has been for our industry to supply the bees that are needed," Brandi says. And farmers like Josh Pitgliano from Tulare County are loving Independence almonds. Pitgliano has several hundred acres of the self-fertile variety — he first started planting Independence trees six years ago. He says he likes that with Independence almond trees, he has to use less than half the number of bees. Whereas most farmers place two hives per acre, Pitgliano scrapes by with half a hive per acre on his orchards of Independence. That translates to big savings: An average hive of bees costs around $180 to hire for the season. Plus, Independence almond trees comes with another perk — easy harvest. "I come in here once and I harvest all the nuts, all at one time," Pitgliano says. 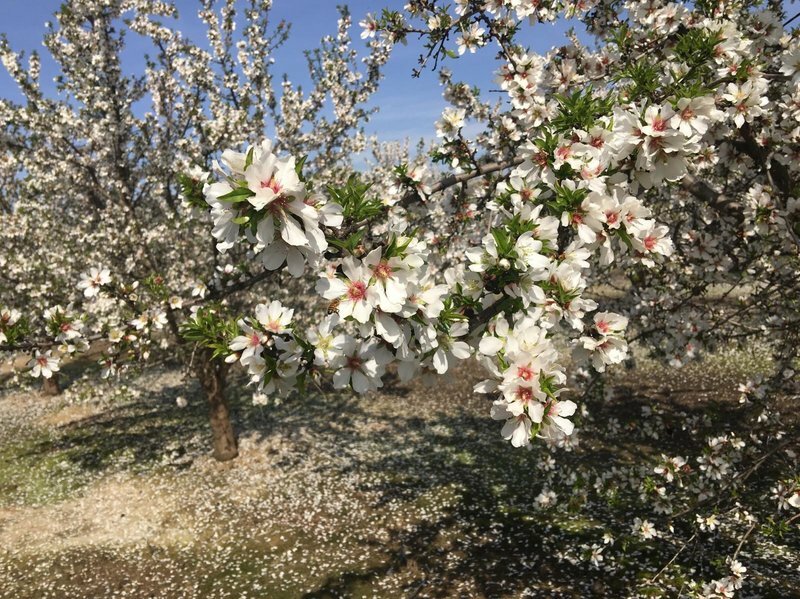 In contrast, traditional almond orchards have several varieties of the tree planted in each field and are harvested multiple times. Barra has farmed everything from sugar beets to eggplant to potatoes. He tore out his peaches and plums after he had a really bad season, losing over $100,000. So he latched onto the idea of a crop that didn't require many bees, that he'd only have to harvest once. And it seems to be working out: Barra says the Independence trees have produced more than he originally expected. "You can't believe it," Barra says. "The first year we did 6,000 [pounds], and then we did 17,000 [pounds]. Last year we did 31,000 [pounds]." This year he's hopes the acreage's yield is over 40,000 pounds, but he realizes he's taking a chance on new tree variety that hasn't stood the test of time. "When I gambled with this," Barra says, "this was the last shot that I was making."